ANAHEIM, California – dbx by HARMAN is showcasing expanded offerings for its DriveRack VENU360 Loudspeaker Management System at Winter NAMM 2016. Dante and BLU link™ enabled versions of the VENU360 extend the versatility of the best-selling VENU360 product family. The Dante compatible VENU360D and BLU link compatible VENU360B units open the VENU360 to a whole new world of live and installed sound systems, including networked systems that want to add a stage or a room to an existing design. The VENU360 provides all the processing and flexibility needed between the mixer and amplifiers to optimize and protect your loudspeakers. 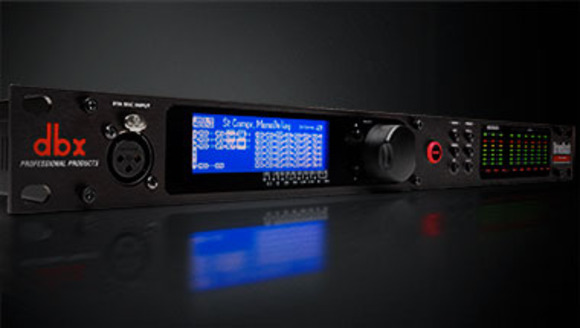 With the latest advancements in dbx’s proprietary AutoEQ™ and AFS™ algorithms, additional input channels, Ethernet control via an Android,® iOS,® Mac,® or Windows® device, and updated wizards, the DriveRack VENU360 continues the DriveRack legacy of great-sounding, powerful, and affordable loudspeaker management processors, for a whole new generation. With an RTA Mic “listening” to the room, the updated DriveRack VENU360 AutoEQ algorithm sets speaker levels and room EQ automatically in a matter of seconds using sine sweeps. This means room adjustments can now be made very quickly, without subjecting an audience to lengthy broadcasts of pink noise. And of course, nothing turns audiences away like annoying and potentially painful audio feedback. To counter this, dbx engineers have improved their already-stellar Advanced Feedback Suppression algorithm. The DriveRack VENU360 “listens” for and anticipates feedback and automatically removes it before it even has a chance, while never altering your sound. More information on the dbx VENU360D and VENU360B can be found at http://dbxpro.com/en-US/products/driverack-venu360-d and http://dbxpro.com/en-US/products/driverack-venu360-b.